American Forces Vietnam Network was created as a morale-boosting military radio station for servicemen and women in Vietnam. AFVN broadcast 24 hours a day, seven days a week for over 10 years; it began broadcasting on August 15, 1962 and ended in March of 1973.After this, it changed its name and was run by civilians in Saigon. 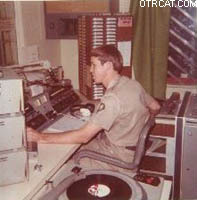 AFVN was a forum for news, comedy and entertainment for the soldiers during the Vietnam War. This collection includes clips from AFVN news shows, ads, advice for soldiers in Vietnam (about drinking water, VD, sending letters and packages and other such interesting blips), DJ intros, and short philosophical and morale-boosting segments. For more war-time recordings, check out the WWII Collection and The Complete Broadcasts of September 21, 1939 and D-Day, June 6, 1944. See also Vintage Airchecks from Great Radio Stations. Looking forward to receiving it and your work collecting the AFVN stuff! You can imagine how cool this is for me as a Vietnam Army Aviator! I used to listen, while in the midst of some heavy stuff during missions as well as after in our underground officer's club! The PSA's and Commercials, that were always overshadowed by the great music, now have a special, more meaningful contex, 48 years later! All I can say is WOW! My order was dealt with professionally and received promptly. The AFVN CD set brings back vivid memories of time spent on oil tankers bringing various oil products from Singapore to Nha Be, on the river near Saigon, between 1970 and 72. One programme I particular enjoyed was Charlie Williams' [if I remember the name correctly] Country Corner Programme, which aired at 0400hrs, the opening theme piece is included the AFVN CDs. I would be interested to know if any Country Corner Programmes are available. I am also completely satisfied with other products I bought from you about ten years ago.